J Carmen Smith: From Lighthouses to Cemeteries! Today, I’m speaking to John and Diane Robinson. 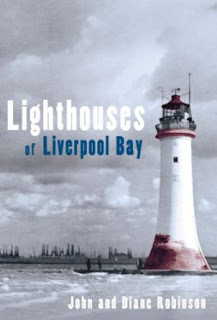 John and Diane, your book, Lighthousesof Liverpool Bay, is beautifully produced and for someone like myself, with no previous knowledge of lighthouses, or the lives of lighthouse keepers, it makes for very interesting reading. It portrays a lonely, arduous and often dangerous way of life that now belongs to maritime history but which would have been of tremendous importance to people like my grandfather, a seaman with the Liverpool-based Larrinaga Shipping Line. Can you tell me something about how the book came to be written – did the idea come from a personal interest, or were you approached by the publisher, Tempus Publishing Limited? 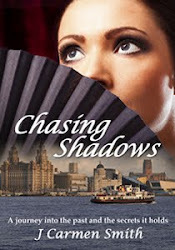 It all started with family history research when it looked as if Diane’s ancestor, an overseer of the embankment, lived at Leasowe lighthouse. So one day we called in at the lighthouse and Eric, the chairman, persuaded us to join the Friends of Leasowe Lighthouse. John did some research, at Merseyside Maritime Museum archive, on the keepers of the light and wrote a little booklet. After that we were hooked. We gave tours of the lighthouse, helped set up an archive and eventually we went on to research the wider aspects of what we now realised were Liverpool lighthouses. How did you set about your research? How much were you able to discover from local archives? Having already discovered that the Maritime Museum held the papers of the Dock Trust, which preceded the Mersey Docks and Harbour Board, we began researching the minutes of the Dock Committee in particular, finding all references to the building and maintenance of the port’s lighthouses and the hiring and firing of keepers, etc. We also found much valuable material at Liverpool Record Office and various record offices and libraries in Wales and on Merseyside. Did you actually visit the site of each former lighthouse? Yes. In fact we stayed in a keeper’s cottage at Point Lynas lighthouse. We were in the West Cottage and the sunsets were wonderful. Each evening we’d watch the dolphins playing off the point. The walks are marvellous, too. Even today it’s very isolated, but for the keepers it must have been a really remote place. Lynas was one of the earliest of Liverpool’s lighthouses and it was, since the 1780s, a pilot station where pilots boarded ships to take them into the port. However, the present lighthouse, as is the case with many of Liverpool’s lighthouses, is not the original building. Although the buildings at Lynas are privately owned now, the automated light is still in operation. We enjoyed standing under the light as it flashed into the darkness. Fortunately, the fog horn never sounded while we were there. I was intrigued to read that Ormeshead lighthouse was eventually converted into a bed and breakfast establishment – were you able to stay there? If so, knowing its past history, how did the experience affect you? We’ve stayed there twice, in two different rooms. The Lamp room is now a sitting room. It’s 325 feet above the sea and is particularly atmospheric on a stormy winter’s night. As we sat, cosy and warm while rain beat on the window, we felt for the poor keepers holding on tight as they cleared the snow from the outside of those great windows! Lighthouses of Liverpool Bay, is full of human interest stories, were there any humorous moments during your travels, or poignant ones? For Diane in particular, New Brighton lighthouse was terrifying to get into because it was Liverpool’s only rock lighthouse. So, twice a day it’s surrounded by the sea. All of Liverpool’s other lighthouses are land-based. When the tide’s out, it stands in a waist-deep moat which you have to wade through to get to a wooden ladder. This has to be lashed to the base of the fixed iron rungs that lead to the doorway, thirty feet above the water. At the top of the iron ladder you must haul yourself onto a narrow platform in front of the great iron door. Once inside, you get a real insight into the cramped conditions in which the keepers worked and lived. It may seem a big leap from lighthouses to cemeteries, but there is a link between your two interests. You both belong to ‘The Friends of Rake Lane Cemetery, Wallasey’, and I see from your website www.wallaseycemetery.co.uk that a past keeper of New Brighton lighthouse, John Thompson Francis, is buried in this cemetery. The cemetery also has other strong seafaring links, with many monuments connected with major maritime disasters of the early twentieth century. I believe The Friends lead regular, themed walks exploring these; perhaps you could tell me more about this aspect of your involvement? Who decides on the format? The format for walks has evolved into ‘Sea Disasters’ (Titanic, Empress of Ireland and Lusitania, all three have lots of local connections), ‘Local and Maritime History’ (includes The Wallasey Hermit, the pilot boat tragedies and the training ship Indefatigable). The two World Wars are also available, depending on the interests of those on the walk. Usually we end at the cemetery chapel, which has been rescued by Father Paul and his congregation and converted into a beautiful Russian Orthodox Church. Do you have a group of volunteers who lead the walks – and how many people usually take part? It’s usually just Diane and John and our chairman, Mark Joynson. Numbers vary. It could be just two people or a group of up to twenty. Are these walks advertised and is it necessary to book a place in advance? They are currently advertised in the Wirral Heritage Open Days booklet and on the internet and are available on request. I believe that you have also undertaken research in connection with the cemetery on behalf of others; from how far afield have these requests come? We’ve had requests and donations from all over the world, Australia, New Zealand, South Africa, Canada, the USA. Often they have also given us extra information about the cemetery’s history and the people buried there. I note from your website that you also hold monthly meetings, are these open to the general public? Yes, we’re happy to see anyone with an interest in the upkeep of the cemetery. Finally, which came first – Lighthouses of Liverpool Bay, or your interest in Rake Lake Cemetery? The lighthouses came first, about fifteen years ago. The Friends of Rake Lane Cemetery started about five years ago. Thank you, John and Diane, for taking the time to answer my questions. I hope your answers will encourage many more Merseyside people to take an interest in our historic maritime past.